ORA has just released a fiery red aquacultured gonipora. This ORA Gonipora is bright red with purple mouths, and should be shipping to local fish stores shortly. 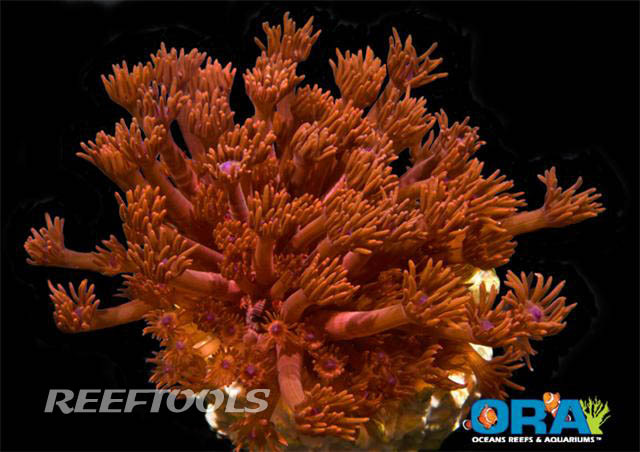 This great new coral from ORA will add a splash of red to your tank (which is so hard to come by). ORA has been growing this strain for almost 10 years, and it will be nice to hive this aquacultured Goni readily available. After nearly 10 years in production, ORA’s Red Goniopora is finally ready for release. This beautiful LPS coral is bright metallic red and has brilliant purple centers. It is truly 100% aquacultured and is considered to be very hardy. Red Goniopora tends to be an aggressive coral and when placed near a competitor it will supercharge its tentacles with nematocysts which will give them a white tipped appearance.